In the blue corner, The Body Shop Passionfruit Body Butter (on the left)! Total: 18 out of 20. 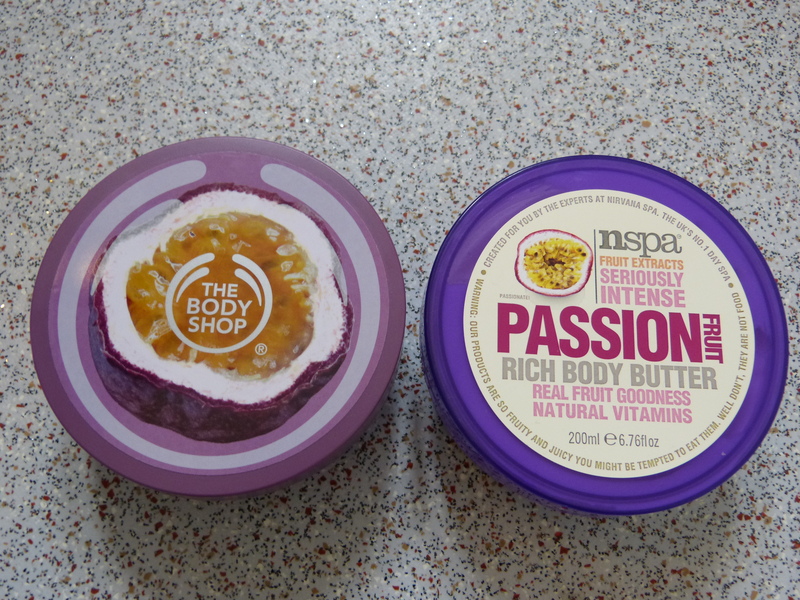 In the red corner, NSpa Passionfruit Body Butter! Body Shop on left, NSpa on right. So, The Body Shop comes out on top, but only just! If you can’t face the £13 price tag for the winner, then get yourself to Asda and try the Nspa version for £3 – it makes me happy, and I’m very picky about my body butter… What’s your favourite body butter? Do you favour the traditional Body Shop offering, or a more unusual brand? This entry was posted in Beauty and tagged beauty products, beauty review, body butter, moisturiser, nspa, passionfruit, skincare, stash, the battle of, the body shop, the body shop body butter, toiletries. Bookmark the permalink. I have a feeling that NSpa aren’t in Japan 😛 but they are lovely! And yes, definitely pick up the TBS ones on sale, no way would I pay £13 for one!! Body Shop products are even more expensive here 😦 Bourjois as well. Their Little Round Pot blushers are the same price as their Healthy Mix Serum! Mental! You should look into Boots’ own brand of body butters. There’s one that’s ‘Mango and Orange Blossom’ I think which I’ve got LOTS of compliments on for feel and smell. I don’t think I’ll ever leave it to be honest! Just like NSpa, it’s £3 as well I believe. I’d love to see how the cheaper version compares to the great Body Shop Body Butter and how it compares to the NSpa one in the same price range. I’ve tried the Boots Extracts body butters before, which are really lovely – they’re a bit more expensive, at £8. I think they’re meant to be competing with the Body Shop! But the Ingredients ones sound really good too, and I am a sucker for a good orange blossom scent 🙂 I’ll have to go have a sniff when I own slightly less ridiculous amounts of body butter! Great comparison post. I think I would buy the NSPA one out of the two – for the price I think you’d have too.